Mesomorphs are natural born athletes and tend to be lean and muscular without trying. Often, their shoulders are wider than their hips According to Sheldon, people with a mesomorph body type tend to have a medium frame. They may develop muscles easily and have more muscle than fat on their bodies. 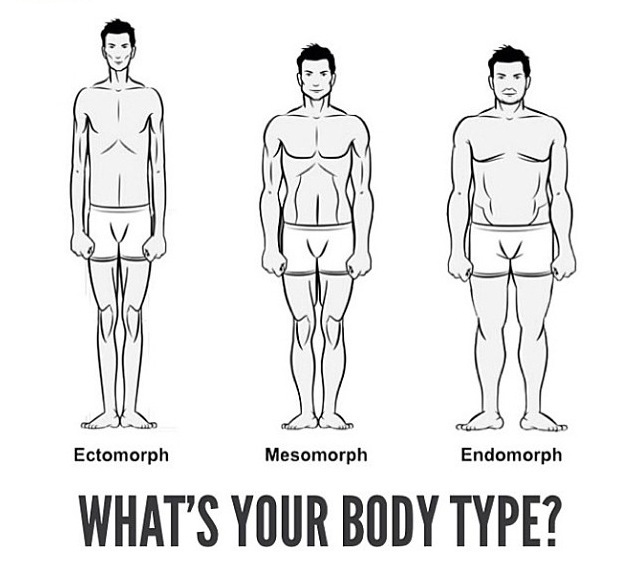 Mesomorphs are typically strong and solid, not overweight or underweight. strong at : running, basketball Etc..
maintain a low fat physique, but does not add muscle or body weight easily. A strongly marked example of an ectomorphic body type is a typical skinny guy. Ecto's have a light build with small joints and lean muscle. Usually ectomorph's have long thin limbs with stringy muscles. Shoulders tend to be thin with little width. take a lot of protein this will make you gain muscle base on my experience.